Despite a strong start by Ray Kerr the Lumberkings took their fourth straight loss on Thursday night. Davenport, IA (June 14, 2018) - The Clinton LumberKings fell to the Quad Cities River Bandits 5-2 on Thursday night at Modern Woodmen Park dropping into a first-place tie atop the Western Division. The loss is the fourth straight for Clinton (37-30) whose offense remained quite over the course of a three-game series sweep to Quad Cities (37-30). LumberKings starter Ray Kerr and River Bandits starter Cesar Rosado traded zeros through for the first three innings before Quad Cities broke out for three runs in the bottom of the fourth inning. The River Bandits loaded the bases when Colton Shaver rolled a ground ball up the middle. Second basemen Joseph Rosa flipped to shortstop Johnny Adams for what looked like an inning ending double play. Adams was ruled to have been off the bag at second allowing Corey Julks to score from third to break the tie. Miguelangel Sierra capped the scoring with a line drive single into center that put Quad Cities on top 3-0. Kerr (2-6) allowed no more runs over his six innings of work but was given the loss. All three of Kerr's runs were unearned and he allowed four hits while walking two and striking out seven. 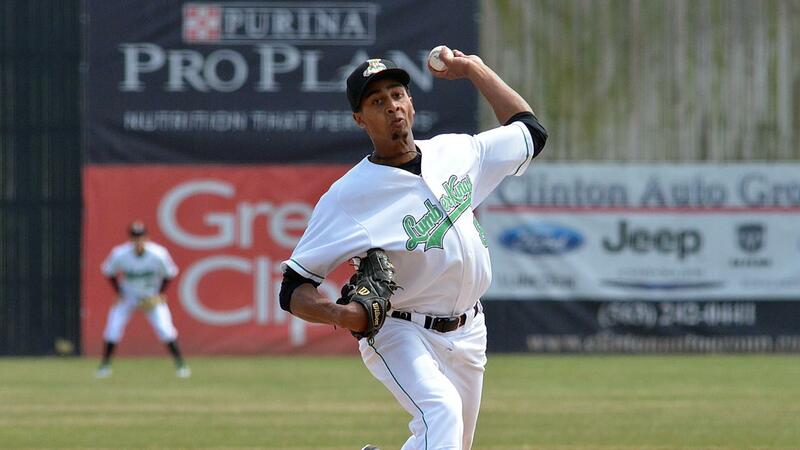 Quad Cities added two more unearned runs off reliever LumberKings reliever Sam Delaplane in the bottom of the eighth. Clinton managed only one, unearned, run against River Bandits starter Cesar Rosado over his 7.2 inning outing. The righty held Clinton to four hits while walking none and striking out nine. Ariel Sandoval was the first run to score for Clinton, coming across in the top of the seventh. The LumberKings outfielder reached by being hit by a pitch to open the frame, stole second and moved to third on a throwing error by catcher Ruben Castro. Sandoval then jogged home to score when Rosado (2-6) was called for a balk. In the top of the ninth, the LumberKings put the tying run on and forced across their second run of the night. Two walks in the inning and a single by Joseph Rosa forced Dean Deatz from the game and Quad Cities turned to Carlos Sanabria. Dimas Ojeda worked a bases loaded walk to force home a run before Sanabira struck out Johnny Adams with the bases loaded to earn his sixth save of the season. The LumberKings will now open a three-game series with the Beloit Snappers starting Friday night. Clinton will throw left-handed pitcher Oliver Jaskie (3-5, 5.63) while Beloit will counter with right Xavier Altamirano (3-2, 3.28). First pitch for game one is slated for 7:00 PM. Fans looking to listen to the game can hear Erik Oas on the call on 100.3 FM WCCI and online at lumberkings.com via the tune in radio ap at 6:45 PM with the pregame show.